To view the news story that this post is based on, click here. As a proud Chanticleer football season ticket holder, there was no way I was going to let my two tickets go to waste. It was 1 p.m. on Saturday and I had no one to give my tickets to. With the game sold out and demand high from people who didn’t get tickets, I offered up my seats on #CCUSocialMedia. I simply sent out a Tweet on our official twitter account asking our audience to retweet it. At 2 p.m. a user who retweeted the message would win the two tickets I had to giveaway. Twenty-five people responded with a retweet but one Coastal student added a little more. This was the tweet that was sent out asking our social media audience to retweet it for a chance to win football tickets. After retweeting the @CCUChanticleers tweet, Marissa Reusch replied with a tweet of her own. She stated that she didn’t have tickets but she did have a dad who was only in town for the weekend before he would fly back out to Kuwait. If at all possible, she would like to take her dad to the game that night. Besides retweeting the tweet, Marisa sent this. Well it was a no-brainer from there. I selected her as our winner of the promotion and hand delivered them the tickets when they arrived on campus. I managed to snap a photo of father and daughter with the tickets in hand. This was the tweet announcing Marisa as the winner. Okay, this isn’t the main point of the blog post. Of course anyone would have done what I did given the situation. Who would deny a man serving our country and a daughter begging for a special experience with her dad a couple of football tickets? No one. But it is what came next that really touched me. 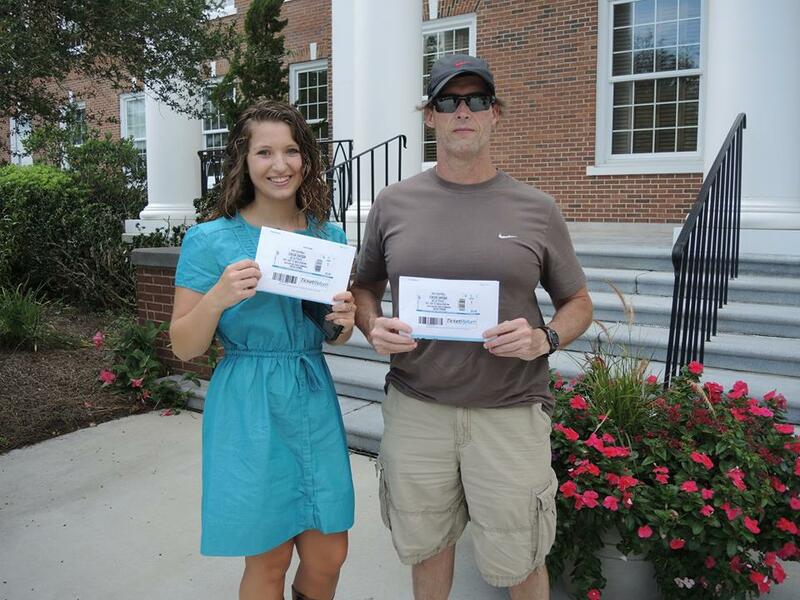 Marisa and her dad, Darryl, with the game tickets they won on Saturday afternoon. Journalism these days centers on social media. Forget about press releases and websites…reporters discover their stories through social media. WMBF, a local news station in the Myrtle Beach/Conway area, noticed the Twitter promotion. The station also noticed the subsequent Facebook post that identified the winners and their special story. Brooke Holden, a reporter for WMBF, tweeted at Marisa with a story request. The next day a news crew was at the airport to speak with Darryl and Marisa Reusch. This was the story produced by WMBF. It chronicled the social media events of Saturday afternoon perfectly. But what it did even better was show the love between Marisa and her dad along with the heartache of saying goodbye. Watching them hug with tears in their eyes made my own eyes water up. The uneasiness of having a loved one serving overseas in a war country is unfathomable to many of us. I want to thank WMBF for putting together such a heartfelt story and to Marisa and Darryl for doing it. As I got misty-eyed at my desk this morning I couldn’t help but once again realize that I love social media and I love my job. Don’t Blink.